U.S. Cargo missions to the International Space Station have officially resumed with the successful rendezvous and capture of the Cygnus OA-4 spacecraft on Wednesday, marking the first Commercial Cargo Vehicle to arrive at ISS after launch failures of both Commercial Resupply Services Partners. Filled with science experiments and supplies, including Christmas presents for the crew, Cygnus made a flawless rendezvous with ISS, leading up to capture at 11:19 UTC. With a firm grip on the 7,500-Kilogram spacecraft, the Station’s robotic arm then went through a range of motions to position the vehicle in position on its berthing port on the Unity Node, becoming the first cargo vehicle to berth to this module. 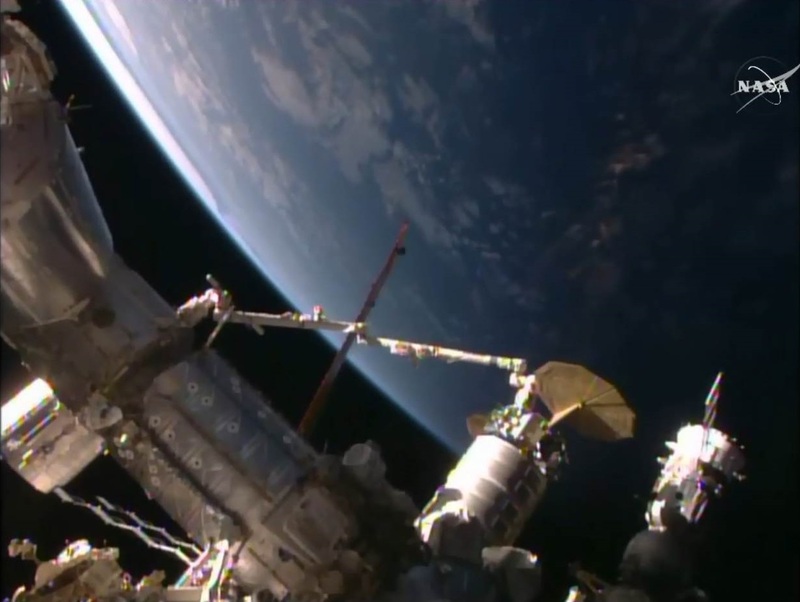 Berthing was marked at 14:26 UTC. Named S.S. Deke Slayton II for the late Mercury 7 Astronaut, Cygnus blasted off atop an Atlas V rocket on Sunday, being placed into a circular Low Earth Orbit from where the spacecraft used its own engines to climb up to the 400-Kilometer orbit of the Space Station. Approaching from behind and below, Cygnus initiated its rendezvous on Wednesday, around three and a half hours prior to the planned arrival at the Capture Point. 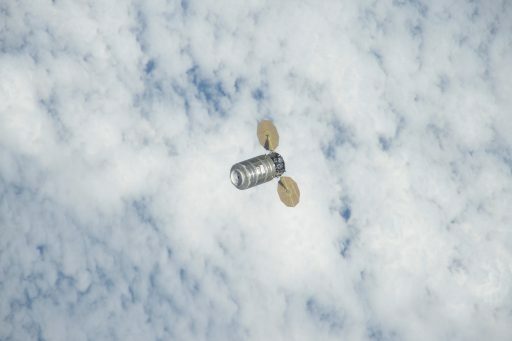 The methodical procedure saw the craft conduct a series of propulsive maneuvers to get lined up in a position 350 meters directly below the Space Station. Switching to its laser-guided proximity navigation system, Cygnus was set for a climb straight up the R-Bar that included two hold points at 250 and 30 meters to allow controllers at the Cygnus Control Center in Dulles, Virginia to check the status of the spacecraft and report to Mission Control Houston where controllers were in charge of the overall decision-making process. As Cygnus got closer to ISS, crew members Kjell Lindgren and Scott Kelly manned the robotics workstation to prepare for the grapple of the spacecraft and watch over the progress of the rendezvous with the ability of sending commands to the vehicle via the Hardware Command Panel. 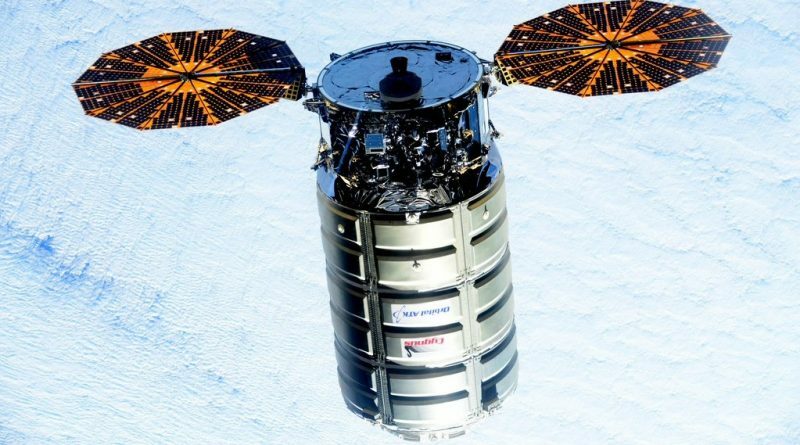 Commanding was not necessary as Cygnus remained centered on its expected path up to ISS. Once at the capture point, Cygnus slowed down to zero relative velocity and nulled out any body rates. The vehicle achieved a very precise position within the Capture Volume of Canadarm2 and started holding still at the Capture Point, ready to be switched to free drift by the crew once they received the GO for capture. Lindgren and Kelly got the go-ahead from mission control which was the last call from the ground and gave the team the green light to reconfigure cameras, place ISS into a Fine Attitude Hold with thrusters disabled, command Cygnus to Free Drift & start motion on the robotic arm for capture. 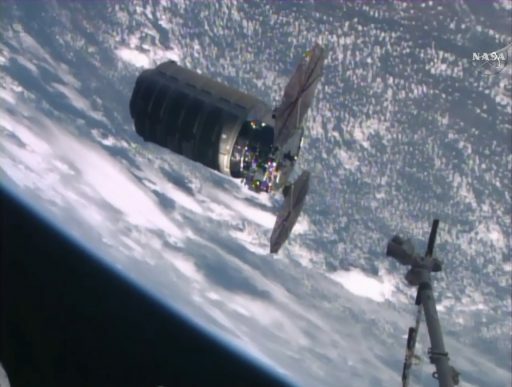 As Cygnus went into Free Drift, all thrusters were disabled to avoid any inadvertent firings during the capture sequence. The SSRMS Latching End Effector was then aligned with Cygnus’ Power & Video Grapple Fixture by Lindgren who used the Translational Hand Controller inside the Cupola to move the arm in the +X direction, carefully approaching the Power & Video Grapple Fixture of Cygnus. The LEE was placed over the pin and snares were commanded to close in order to obtain a firm grip of Cygnus. 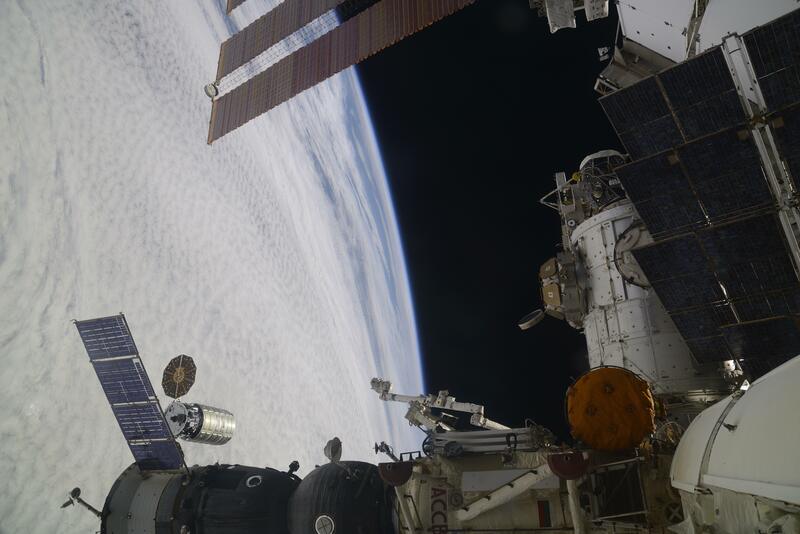 The arrival of the Cygnus craft marked the first Commercial Cargo Vehicle visiting ISS since April after failures of the Antares rocket in October 2014 and the SpaceX Falcon 9 in June. 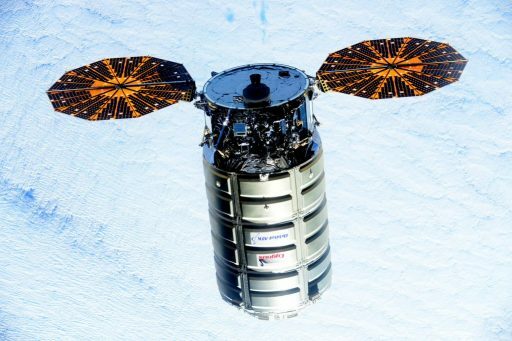 Orbital ATK will conduct another interim Cygnus mission using Atlas V in March before returning a modified version of the Antares rocket to flight in May. SpaceX is aiming for a return to flight of the Falcon 9 later this month followed by the company’s next mission to ISS in early 2016. With Canadarm2 having a firm grip of Cygnus, the crew handed duties off to ROBO Controllers on the ground to begin the multi-hour operation of berthing the spacecraft. Cygnus went through a series of reconfigurations and ISS maneuvered back to its nominal attitude while the arm took Cygnus through a range of motions, reaching a standoff position at the Unity Node. The Earth-facing port of Unity was freed up earlier this year when the Permanent Multipurpose Module was moved from Node 1 to Node 3, giving ISS two operational berthing ports for visiting vehicles on the U.S. Segment. Controllers precisely guided Cygnus to its pre-berth position, taking some additional time to verify the spacecraft was positioned with millimeter-accuracy before four capture latches were closed and the robotic arm went to a limp mode for the second stage capture. 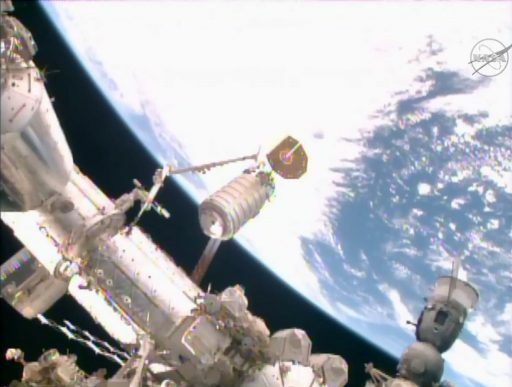 16 bolts were commanded in four sets of four to firmly pull Cygnus in and form a pressure tight seal between ISS and the Common Berthing Mechanism of the spacecraft. Capture was confirmed at 14:26 UTC and Mission Control started the process of loading each bolt with a specific torque value. Later on Wednesday, the ISS crew will go through leak checks on the interface between the spacecraft ahead of the opening of the Node 1 hatch to be followed by the removal of electronics assemblies and the installation of power and data jumpers. Hatch opening on Cygnus is planned on Thursday to open the spacecraft for business as part of a docked mission of around two months. Cygnus is loaded with 3,500 Kilograms of cargo that will be transferred to the Space Station over the course of the next several weeks. The cargo of the OA-4 mission is comprised of 1,180 Kilograms of crew supplies, 1,000kg of systems hardware, 850kg of science equipment and 300kg of EVA hardware and computer resources. The crew supplies include 144 bags of food as well as clothing for Scott Kelly and upcoming crew members Tim Kopra, Time Peake and Jeff Williams. Spare parts and systems hardware delivered by Cygnus is comprised of a new cycle ergometer, sampling kits, a carbon dioxide monitor, acoustic dosimeters and hardware for the C2V2 visiting vehicle communications system. High-pressure gas tanks delivered by Cygnus will be used to replenish the gas handling system on the U.S. Segment after the retirement of the Space Shuttle that used to fulfill this replenishment function. Science gear packed into Cygnus comes from all ISS partner agencies except Roscosmos. Highlighted science payloads include a new life sciences incubator system, an experiment investigating how liquids behave in packed column reactors in microgravity, and a combustion study that examines different textile treatments for their flame retardant behavior. The spacecraft is delivering over a dozen small satellites, including a new deployment system and the first Microsatellite to be released by the Station’s Japanese Robotic Arm. EVA equipment delivered by Cygnus includes a new SAFER jetpack, space suit gloves and legs, components for the airlock cooling loop, and various EVA tools. Finally, Cygnus is delivering new laptops, hard drives and cameras for use by the crew.